My final interview for the current (but ending TODAY at midnight!) 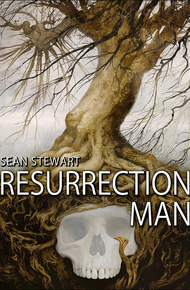 Aurora Award ebook bundle at Storybundle is with Sean Stewart, author of Resurrection Man. What is your favourite scene in the book, and why? My favourite scene in Resurrection Man is easy - the opening. The whole idea started with a single thought as I was standing at a bus-stop in Vancouver: Wouldn't it be an incredible opening for a book if you started with the main character performing an autopsy ... on himself. ?!? This was immediately followed, of course, by me thinking "That's stupid. That's impossible. What would that even mean?" But my Writer's Spidey-Sense was going off like crazy, assuring me that this was a Really Good Idea; that if I lived to be 100, I was never going to come up with a better metaphor for, um, self-examination. So I slowly had to build the whole world of the book back to get to that first scene: Dante in the boathouse with his sister Sarah and his step-brother Jet, nervously picking up a filleting knife and about to cut into his own dead body. Did you know you were writing a series when you first began this book, or did the idea of a series grow from the telling of this book? This might be the biggest mistake of my career. I totally thought of this as a stand-alone novel ... but in fact it laid the course for my next four books. Two of them, Mockingbirdand Perfect Circle, were stylistic children, as I explored the "magic in the real world" vibe at the heart of Resurrection Man. Two others, The Night Watch and Galveston, which won the World Fantasy Award, were literally set in the same world as Resurrection Man, but years in the future, with different characters and locations. If I had it to do all over again, I would have written a multi-volume saga following the same characters through that historical timeline. What is your favourite character or relationship in the book, and why? I really had fun with Dante's step-brother, Jet. He is a grouchy, sardonic dude - one of those people who feels like they never quite fit in. He keeps a ball of rust for a pet, throwing in a staple or a piece of steal wool once a month or so, and a paperclip as a treat for Thanksgiving and Christmas. Jet is convinced that he is a changeling of some kind, a person without a soul. Late in the book someone else tells him that souls aren't something you're born with - they silt up over time, like sandbars, based on who you are and what you have done. He finally gets the fact that everybody else thinks of him as just part of the family, and in his own grumpy way has no defense against the fact that his family loves him and cares about him. I think everyone knows that person who is armored against insults, but hapless against affection; it was fun to show that dynamic between him and the rest of the family. Can you give us a fun fact about the book? This e-book edition is special, and better than the original published version, because my old friend and accomplished artist Marc Taro Holmes created a series of gorgeous illustrations just for the online version. I think they add a terrific mood and ambiance to the reading experience, like adding a score to a film. I hope other people like them as much as I do. Thanks, Sean. Readers, this is absolutely your last chance to get this amazing deal on ten award winners and finalists for the best in Canadian speculative fiction. Go to Storybundle NOW to pick up this excellent collection of novels and anthologies. The bundle is over at midnight today.